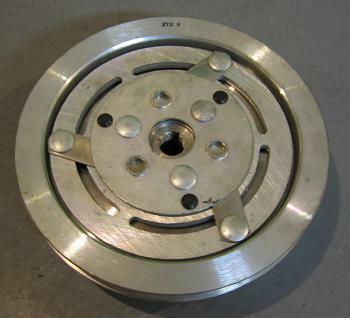 This page contains application and service part or engineering number descriptions for the many accessory pulleys used on 428 CJ and SCJ Mustangs. Much of the information listed here has been gleaned from build/broadcast sheets, master parts catalogs, and ongoing discussions with people who work with these parts for a living. All measurements are approximate and may differ from your own measurements within manufacturing tolerances. Please note that all references to 1968 applications with air conditioning are for the Shelby GT500KR. Air conditioning was not an available option for the non-Shelby Mustang equipped with a 428 CJ engine. Air conditioning compressor clutch pulley notes: The 1969 and 1970 pulleys and field coils DO NOT interchange! Field coil engineering numbers are typically stamped on the coil mounting bracket or found on a sticker attached to the part. 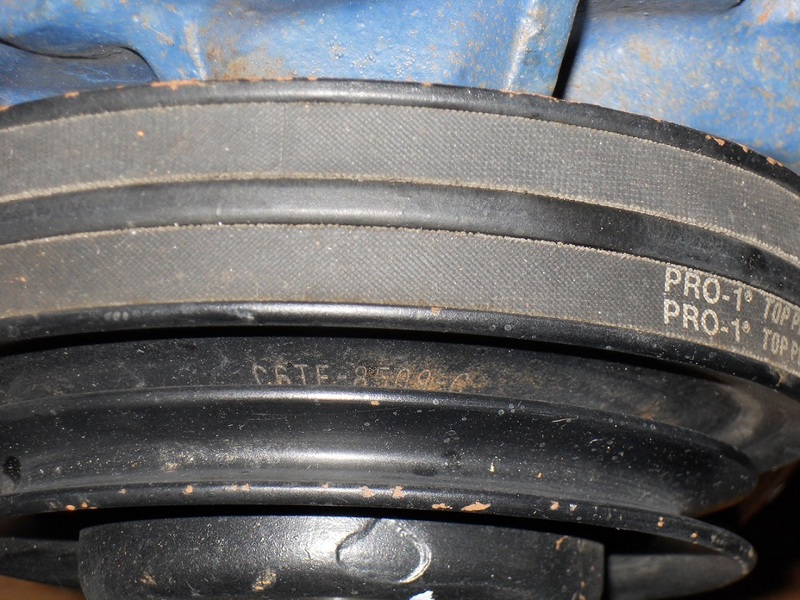 Pulley engineering numbers are typically stamped on the face of the clutch or found on a sticker. 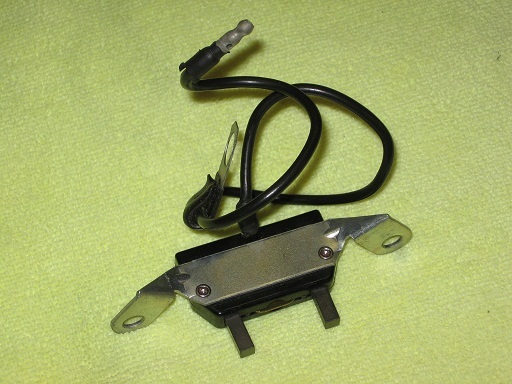 From notes I see in the 1975 Master Parts Catalog it appears that the 1969 C9AZ-B clutch was typically used with hang-on (non-integral) air conditioning systems. Air conditioning idler pulley notes: These pulleys do not always have stamped or cast numbers, but I have seen a D0AZ-8678-D pulley with a stamped D0AA8A617D1 engineering number on the mounting bracket. 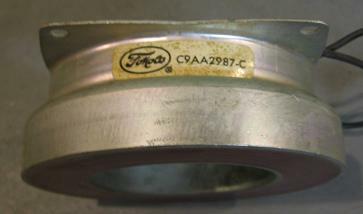 Ford cross-reference manuals also list a D0AA8A617D2 engineering number for the D0AZ-8678-D pulley. It could be that the original production pulleys were stamped, and later replacement pulleys weren't stamped. 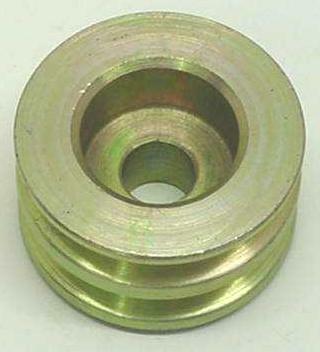 These idler pulleys are not part of the clutch assembly. 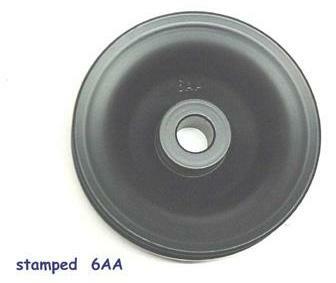 The 1975 MPC lists the D0AZ-8678-C pulley for 1968 and 1969 applications as this pulley replaced the earlier C8AZ-8678-A pulley. 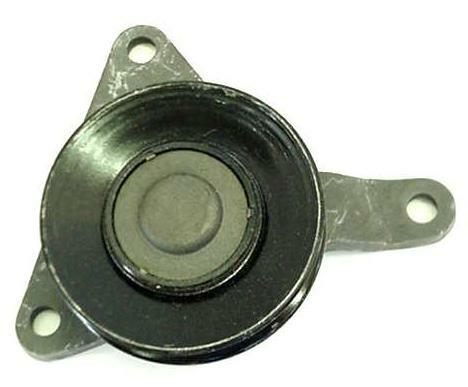 Alternator pulley notes: Numbers may be stamped into the metal or ink-stamped if present. The 1975 MPC also lists the 1969 engineering numbers for 1968 applications as the earlier parts were obsoleted. Several different engineering numbers can be found as listed above. Crankshaft pulley notes: These pulleys bolt onto the harmonic balancer, unlike some other Ford crank pulleys and balancers that are joined. 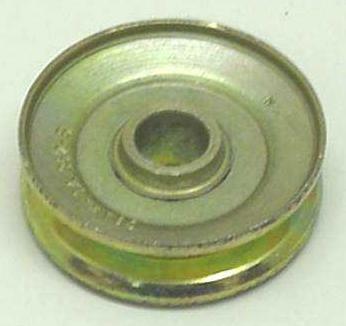 The 1975 and earlier MPCs note that the C8AE-6312-E pulley was replaced by the C8AE-6312-D pulley. Yes, that means a two-sheave pulley was replaced by a three-sheave pulley. 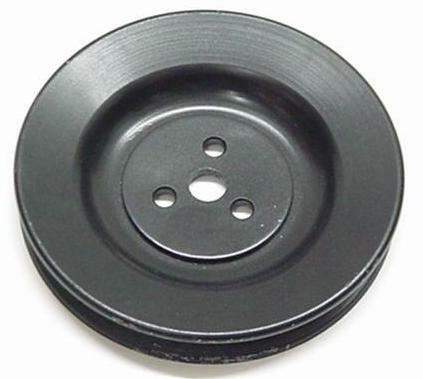 I and others have been unable to locate a service part number for this pulley; it may well be a factory-only part that was never serviced by Ford. 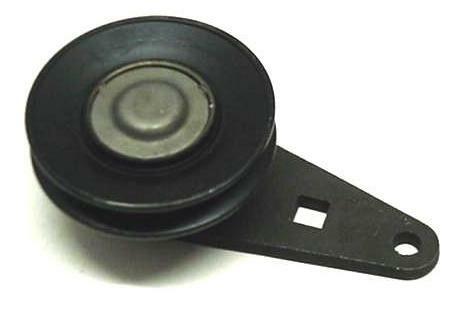 Power steering pulley notes: Ford documentation describes a change-over date for the 6AA pulley to the larger diameter 80B pulley of October 21, 1968 to address overheating issues. Only the AF pulley is somewhat controversial. 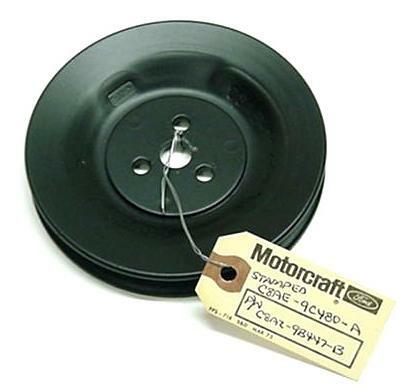 The 1975 MPC and some vendors describe the pulley used in air conditioning applications as having a 7AA engineering number, but I've seen period master parts catalogs that list the AF pulley and original vehicles equipped with the AF pulley, so I'm leaning that way. 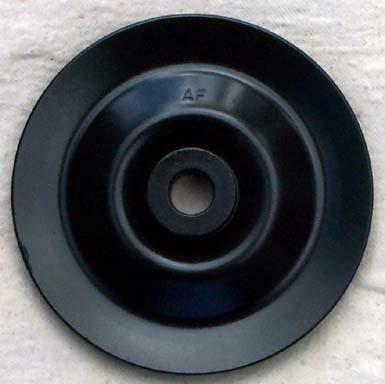 The 1975 MPC describes the 7AA (C7AZ-3A733-A) pulley as a replacement for the AF pulley, though a replacement date isn't identified. All are single-sheave pulleys. 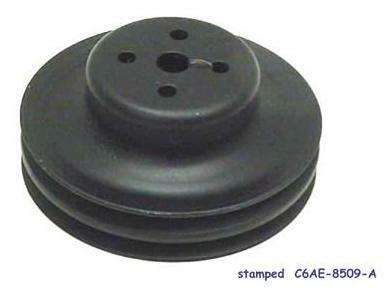 Smog pump pulley notes: The picture of the smog pump pulley for "without air conditioning" applications has a tag with the part number displayed. 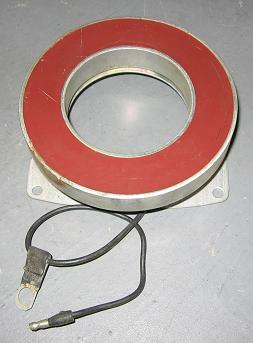 The "with air conditioning" pulleys appear to be a lot less common, though reproductions of the 1969-1970 pulley are being made. All are single-sheave pulleys. 1968 CJ C8OZ-8509-C C8OE-8509-A Not identified 5 3/64"
(before February 17, 1969) C8OZ-8509-C C8OE-8509-A 8OEA 5 3/64"
(after February 17, 1969) C8AZ-8509-D C8AE-8509-C 8AEC 6 17/64"
1969 SCJ C8AZ-8509-D C8AE-8509-C 8AEC 6 17/64"
(before September 1, 1969) C8AZ-8509-D C8AE-8509-C 8A9C 6 17/64"
(after September 1, 1969) C8OZ-8509-C C8OE-8509-A 8O9A 5 3/64"
Water pump pulley notes: There's a little controversy here. Let me start by saying that I believe that the 1975 Master Parts Catalog contains errors in the section describing Mustang water pump pulleys for 428 CJs and SCJs. I believe there are errors based on a combination of build sheet information and information found in the April 1970 Master Cross Reference List. 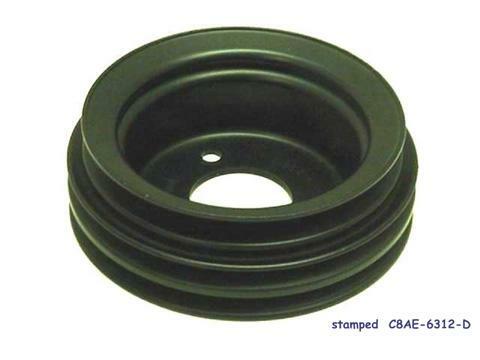 For example, the MPC says that the engineering number for a 1970 SCJ water pump pulley is C8DE-8509-A. 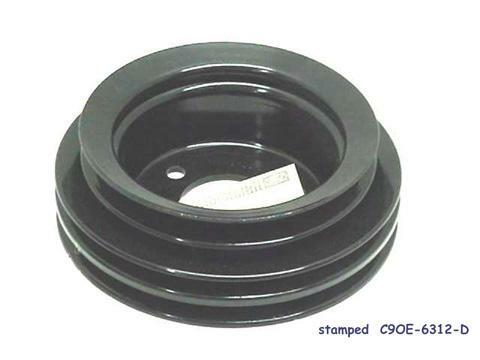 The Master Cross Reference list for this same pulley with service part number C8OZ-8509-C identifies the engineering number as C8OE-8509-A. Looks like someone mistook an "O" for a "D". The MPC also doesn't list a separate pulley for 1969 SCJs, but build sheets clearly show that those cars typically used a different pulley than the 1969 CJs. Notice that I said "typically". I also have a few 1969 CJ build sheets that show those cars being built with the C8AE-8509-C pulley. 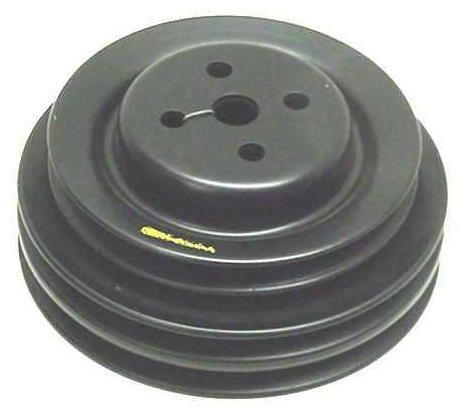 All are three-sheave pulleys except for the C6AE-A pulley, which has two sheaves. 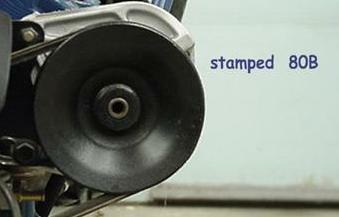 I recently received a picture of an NOS C8OE-8509-A pulley that includes a Ford logo ink stamp. Thanks to Brandon Badell for the picture. 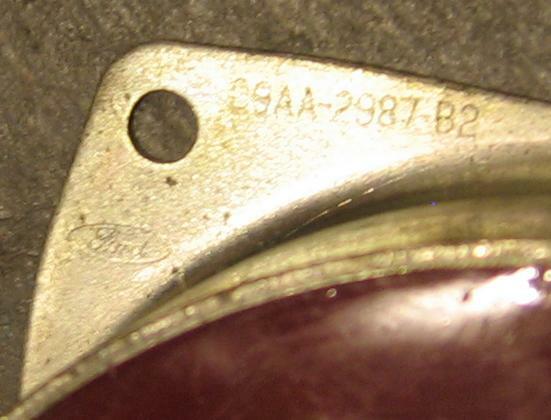 Ford often made new pulleys by spot-welding an additional sheave on when necessary. 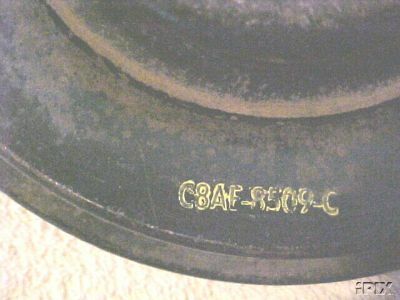 For example, the C8OE-A pulley typically has an ink-stamped "C8OE-8509-A" number, but if you look closely between the outermost sheave and the middle sheave (thanks to Brian Conway for the picture) you can see other stamped information, including "C6TE-8509-C" and a FoMoCo logo. 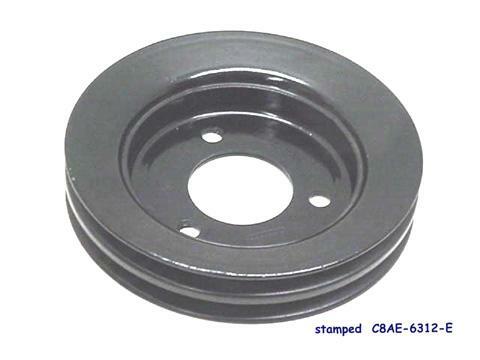 The C8AE-8509-C pulley has been observed with "C8AE-8509-A" stamped between the sheaves. No power steering, no air conditioning: This setup includes a smog pump pulley with one sheave, crank and alternator pulleys with two sheaves, and a water pump pulley with three sheaves. Two belts route through the alternator pulley, crank pulley, and inner two sheaves of the water pump pulley. 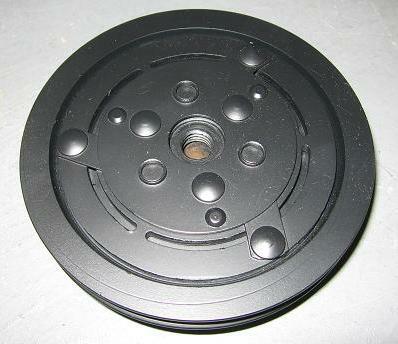 The outer sheave of the water pump pulley routes to the smog pump pulley. Power steering, no air conditioning: This setup includes smog pump and power steering pulleys with one sheave, alternator pulley with two sheaves, and crank and water pump pulleys with three sheaves. Two belts route through the alternator pulley, inner two sheaves of the crank pulley, and inner two sheaves of the water pump pulley. The outer sheave of the water pump pulley routes to the smog pump pulley. 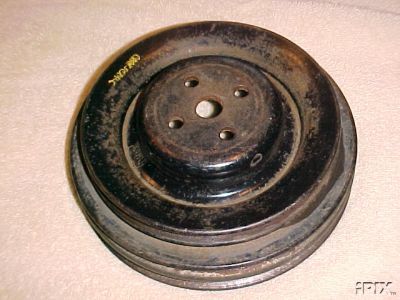 The outer sheave of the crank pulley routes to the power steering pulley. No power steering, air conditioning: This setup includes a smog pump pulley with one sheave, alternator and water pump pulleys with two sheaves, and crank pulley with three sheaves. Two belts route through the alternator pulley, inner two sheaves of the crank pulley, and the water pump pulley. 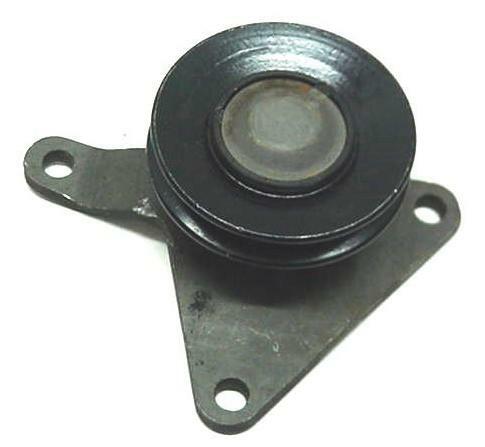 The outer sheave of the crank pulley routes to the smog pump pulley, air conditioning idler pulleys, and the air conditioning compressor clutch pulley. Power steering and air conditioning: This setup includes smog pump, power steering, and alternator pulleys with one sheave, water pump pulley with two sheaves, and crank pulley with three sheaves. One belt routes through the alternator pulley, innermost sheave of the crank pulley, and the innermost sheave of the water pump pulley. A second belt routes through the middle sheave of the crank pulley, the outer sheave of the water pump pulley, and the power steering pulley. The third belt routes through the outer sheave of the crank pulley to the smog pump pulley, air conditioning idler pulleys, and the air conditioning compressor clutch pulley. As always, I am very interested in hearing from people who have original pulley observations that differ from any information appearing on this page. Build sheets don't always tell the tale, so information taken directly from the field is most helpful. I am especially grateful for the contributions of JD Larson of All Classic Motors and Bill Upham of Mansfield Mustang, who have provided much assistance in trying to analyze the differences between observations, catalogs, and build sheets. Peter Disher also helped by providing number and application information. Thanks to Bill Upham for almost all of the pictures used here.